There is a radical difference between church as we know it, and ekklesia as God intended it. This book will challenge you to consider God's specific, New Testament design for the Body of Christ and how God's blueprint for a temple can only be fulfilled in the lives of His people. Keith Giles is a teacher, author, copywriter, activist, and servant of Jesus living in Orange County, California. In 2006, he walked away from his paid on-staff position at a local church to start a house church that gives away 100% of all offerings to the poor in their community. He currently works as an advertising copywriter for the world's largest technology distributor. He is the author of "This Is My Body:Ekklesia As God Intended" and "The Power of Weakness" among others. "I highly recommend reading This is My Body. Since I was dissecting it to find the parts to emphasis for my presentation I had the opportunity of reading most of it several times. I contacted Keith before leaving for Africa to ask permission to share the material and add my own examples and illustrations. I believe that this book has the potential to be used to train church planters all over the world in the world." - Ken Eastburn, Director of House2House Ministries. "Giles calls the church back from its preoccupation with business models and encourages believers to embrace spiritual relationships with one another and dependence on the Holy Spirit as we read about in Scripture." - Alan Knox, Doctoral Student, Biblical Theology. "From a scriptural and practical point of view, the book challenges the method and the mentality of the traditional/denominational church system, and calls us all back to God’s original design for Christ’s body." - Rad Zdero, Author of "Letters To The House Church Movement"
"Allow me to start by saying This Is My Body is FANTASTIC! And I’m not just saying that because I’ve known the author for nearly 25 years. I say it because This Is My Body is a much needed treatise about the state of the church in North America." - Kent Williamson, Director of the documentary, "Rebellion of Thought". 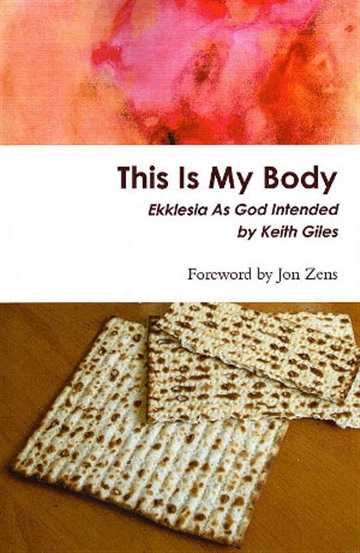 "Keith Giles’ latest gift, This is My Body Ekklesia As God Intended is an invitation to be the family that The Church was meant to be. In a time when it is hip to be down on church and many of us are sure we can plant the next great congregation, Giles speaks softly, calling us back to the Scriptures and the One who first invited us to partake at the table together." - Crissy Brooks, founder of MIKA Ministries, Costa Mesa, CA.